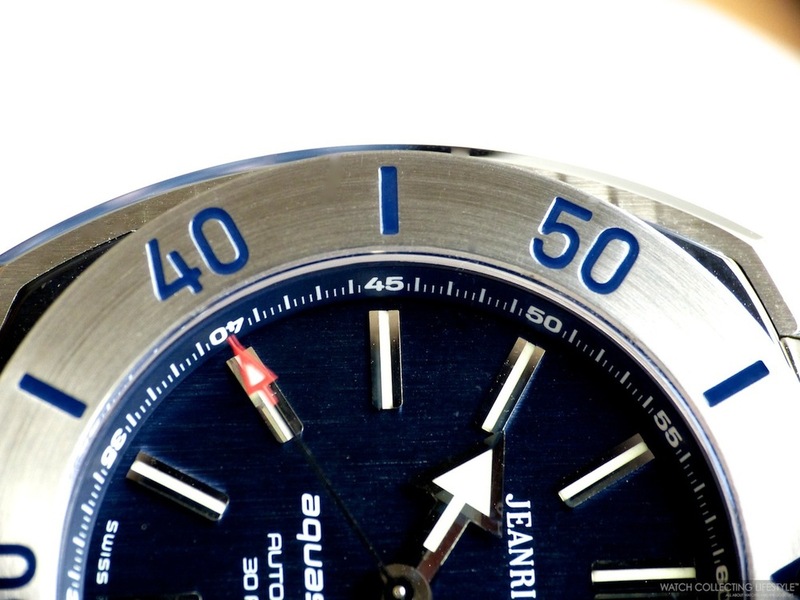 Insider: JEANRICHARD Terrascope Aluminum. A Fun Timepiece in the Three Primary Colors. The JEANRICHARD Terrascope ref. 60500-10-702-FK4A released earlier this year during Baselworld 2014, is as colorful as any luxurious timepiece gets. This is not a bumble bee, nor a volcano —perhaps some of the most colorful timepieces out there—, this is a beautifully finished timepiece that might be perceived as too loud and bright by a few, but for others quite fun and unique looking. The new JEANRICHARD Terrascope Aluminum features an ultra colorful aluminum case —not as light as many would imagine weighing 108 grams— in blue, red and green measuring 44 mm in diameter with the unmistakeable vertical satin brushed finish of the JEANRICHARD collections. Literally, a perfect interpretation of the three primary colors, all rounded up by a beautiful white dial with blued applied markers with orange luminescent material and a blue rubber strap. Posted on September 2, 2014 by Editor & Publisher and filed under JEANRICHARD, Other Brands and tagged JEANRICHARD Terrascope ref. Ref. 60500-10-702-FK4A JEANRICHARD Calibre JR60 Top Brands. Baselworld 2014: JEANRICHARD Terrascope with Bronze Dial. A Watch Perfectly Suited for an African Safari. Live Pictures and Pricing. JEANRICHARD—sister company to Girard-Perregaux— takes its name from a legendary name in watchmaking, Daniel Jeanrichard. This genius pioneered the development of the watchmaking industry in the Neuchâtel mountains in the late 17th century. Daniel Jeanrichard was born in the hamlet of Les Bressels, midway between La Chaux-de-Fonds and Le Locle. In 1681, he created his first watch, then set up his watchmaking workshop. Daniel Jeanrichard was also a major driving force behind the watchmaking industry. He was ahead of his time, demonstrating a talent for innovation. In addition to the production of watches, the region’s watchmakers are indebted to him for the invention of machines and tools, and for establishing the basis for learning the art of watchmaking itself. At Baselworld 2014, JEANRICHARD presented several new watches including this new Terrascope with satin-brushed bronze dial and a gorgeous ostrich strap. This watch just like the rest of the watches in JEANRICHARD's Terrascope collection is fitted with a stainless steel vertical satin-brushed finished case measuring 44 mm in diameter. This Terrascope is powered by the JEANRICHARD automatic calibre JR60 with 26 jewels and which provides a power reserve of 38 hours when fully wound. The watch features a solid case back and is waterproof to a depth of 100 meters, regardless of the lack of a screw-down crown. On the wrist, the watch has great wrist presence and craftsmanship for the price. This is actually one of our favorite new JEANRICHARD timepieces unveiled at Baselworld this year. The uniqueness of its dial along with the ostrich strap, make this watch a perfect companion for that next safari to the Serengeti. Sticker Price 2,600 CHF ex VAT. For more info on JEANRICHARD click here. 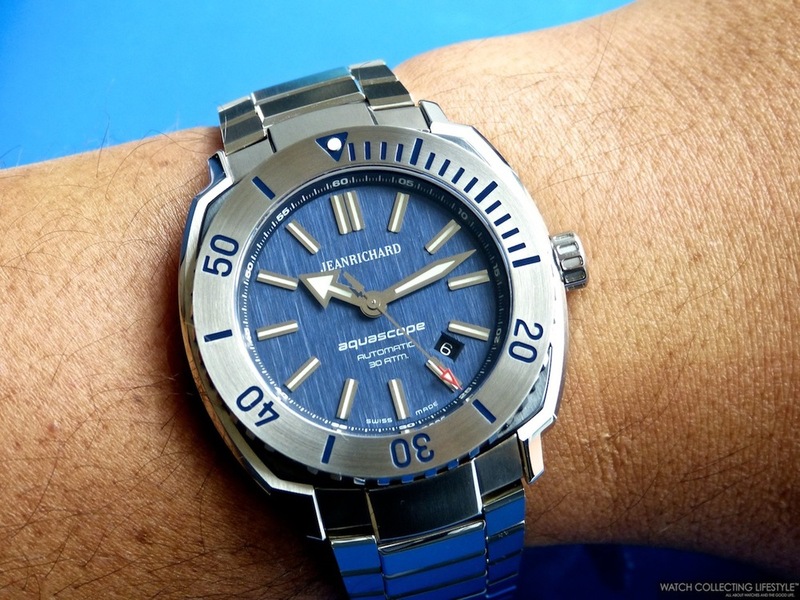 Posted on April 10, 2014 by Editor & Publisher and filed under Baselworld, JEANRICHARD and tagged JEANRICHARD Terrascope. News: JEANRICHARD Launches the Aeroscope 208 Seconds. Honoring Captain Chesley "Sully' Sullenberger and the Miracle on the Hudson. Last night January 14th, 2014, JEANRICHARD honored its brand ambassador, Captain Chesley “Sully” Sullenberger to commemorate the 5th Anniversary of the landing of Flight 1549 on the Hudson River with the launch of the special edition “208 Seconds” Aeroscope watch. The event that took place at a well-known watch store on Madison Avenue in New York City, celebrated how the American hero saved 155 people in only 208 seconds on January 15, 2009. 208 seconds made Captain Sullenberger a hero and the watch's automatic chronograph movement perfectly embodies the spirit and respect that the Captain and JEANRICHARD have for time. The 208 seconds are represented by a subtle marked white and red timeline on the timepiece’s black dial. Available on a black Barenia calfskin strap, the JEANRICHARD “208 Seconds” Aeroscope is a re-interpretation of the old aviators’ watches, and with its titanium cushion-shaped case shares a man’s most enduring dream with style. Part of the proceeds of the watch will go to The American Red Cross and The Rory Staunton Foundation, two of Captain Sullenberger's philanthropic endeavors. Throughout the event guests also participated in a social media challenge, where they were tasked to take a wrist shot of the new “208 Seconds” Aeroscope and post it to their Instagram account. The “Best Shot” will be re-grammed today, January 15th, through the brand’s Instagram account @JRwatches. The winner will receive a “208 Seconds” Aeroscope watch. Posted on January 15, 2014 by Editor & Publisher and filed under Events, News, JEANRICHARD and tagged JEANRICHARD Aeroscope 208 Seconds Bruno Grande COO JEANRICHARD Chesley Sully Sullenberger. Insider: JEANRICHARD Aeroscope Black Chronograph. A Spectacular Black Timepiece for Black Friday. Considering that today is 'Black Friday' here in the U.S., why not feature one of the nicest black watches in the market. 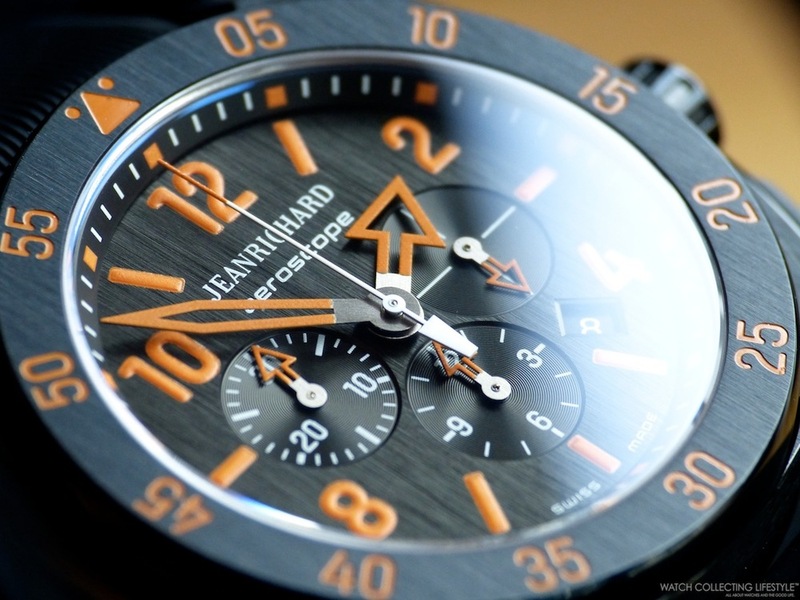 This beautiful JEANRICHARD Aeroscope Black Chronograph ref. 60650-21J613-FK6A comes in a traditional cushion-shaped case with vertically satin-brushed finished DLC-coated black titanium case and bezel with pushers protected by carbon fiber composite surface. The case measures 44m in diameter and as we said it before when reviewing the JEANRICHARD Aquascope here, its satin-brushed finish is only comparable to the grain on the finish of Audemars Piguet Royal Oaks or Royal Oak Offshores. The case and bezel feature satin-brushed and highly polished areas and depending on the light, the watch tends to look more graphite grey than black. The look and feel of this watch is more of a black ceramic watch rather than that of a DLC titanium timepiece. This watch features a beautiful black dial also finished with a satin-brushed vertical finish, circular satin-finished chrono registers, orange luminescent Arabic numerals —not very bright at low light—, a 12-hour chrono register at 6, a 30-minute chrono register at 9, a running seconds register at 3 o'clock and a date aperture between 4 and 5 o'clock. The dial is extremely nicely but somewhat busy, The arrow-shaped hands in orange also with luminescent material provide a nice contrasting touch and good readability. The fixed bezel is also spectacularly finished and it features an orange minute scale with 5-minute increments with no luminescent material. The bezel along with the dial, makes this watch look ultra sporty and quite rugged. This watch features rectangular chrono pushers with carbon fiber composite and the start/stop pusher requires a strong push to activate the chronograph. The beating heart inside this watch is the automatic calibre JR66 with 43 jewels, which provides a power reserve of 42 hours when fully wound. During our review the watch seemed to be keeping perfect time with a variation of +1 seconds over a four day period. 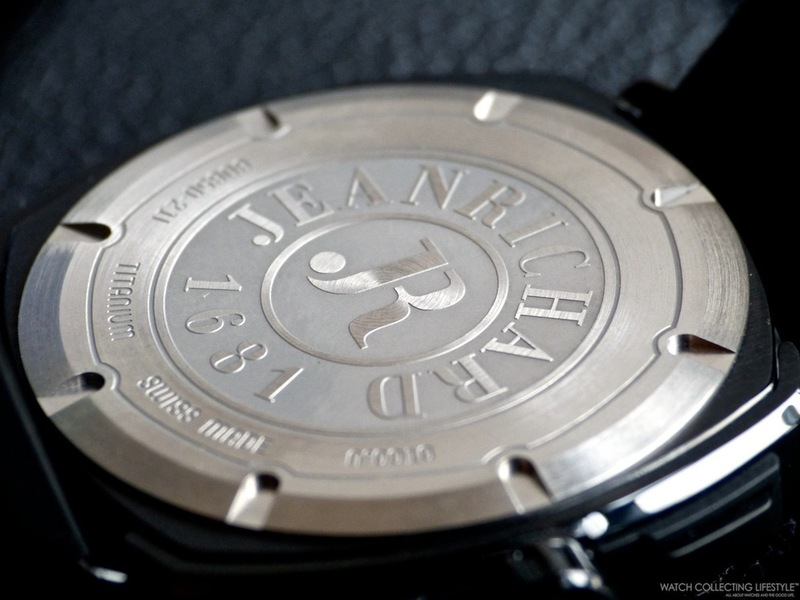 The calibre is perfectly protected by a solid case back carefully engraved with the JEANRICHARD logo. To round out its sporty look, this watch is fitted with a very comfortable rubber strap with JR markings near the lugs and a easy to operate deployant buckle. The strap is somewhat short but nicely finished. On the wrist the watch wears extremely comfortable and way smaller than its actual size. 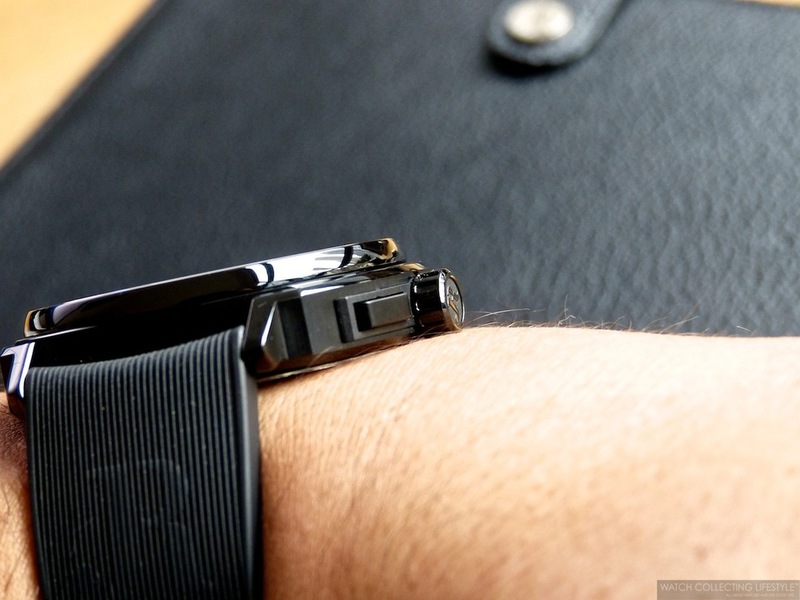 This is something really positive for those with wrists smaller than 7" that want to wear a 44mm size watch. Overall, this is a very nice looking watch with an ultra sporty character that comes with a very nice price tag. If you are looking for an understated chronograph that is exclusive and extremely well finished, look no further. Sticker Price $5,270 USD. For more info on JEANRICHARD click here. Posted on November 29, 2013 by Editor & Publisher and filed under Other Brands, JEANRICHARD and tagged JEANRICHARD Aeroscope Black Chronograph ref. 60650-21J613-FK6A Halloween. Photo of whale on the background by Doug Allan & Sue Flood. If you are looking for a diver's watch that is elegant but understated at the same time, rich in history and with great craftsmanship but you can't spend more than $3,500 USD, then look no further, this JEANRICHARD Aquascope ref. 60400-11B401-11A in stainless steel is the best value for your money. JEANRICHARD—sister company to Girard-Perregaux— takes its name from a legendary name in watchmaking, Daniel Jeanrichard. This genius pioneered the development of the watchmaking industry in the Neuchâtel mountains in the late 17th century. Daniel Jeanrichard was born in the hamlet of Les Bressels, midway between La Chaux-de-Fonds and Le Locle. In 1681, he created his first watch, then set up his watchmaking workshop. Daniel Jeanrichard was also a major driving force behind the watchmaking industry. He was ahead of his time, demonstrating a talent for innovation. In addition to the production of watches, the region’s watchmakers are indebted to him for the invention of machines and tools, and for establishing the basis for learning the art of watchmaking itself. 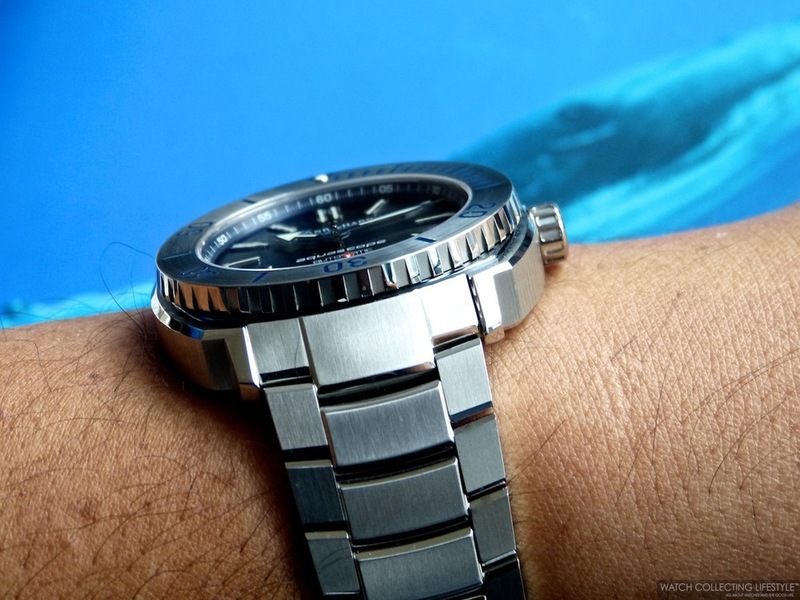 This massive cushion-shaped diver's watch weighing —approximately 260 grams— more than an Audemars Piguet Royal Oak Offshore Diver on bracelet or a robust Omega Seamaster Planet Ocean XL is fitted with a very solid vertically satin-brushed finished stainless steel case with blue PVD coating around the corners —these PVD coating makes the case appear like there's a case within another case. The case measures 44m in diameter and its satin-brushed finish is only comparable to the grain on the finish of Audemars Piguet Royal Oaks or Royal Oak Offshores. We promise we are not exaggerating. The blue dial on this watch is also perfectly finished with a vertical satin-brushed finish to match the superb craftsmanship of the case. The dial is reminiscent of timepieces from the 70s with that same hue that varies depending on lighting conditions and the angle at which you look at it. The dial features applied rhodium-coated indexes and rhodium-coated hands both with luminescent material that glows strong and long lasting. The seconds hand features a red arrowhead tip, the minute hand is sword shaped and the hour hand is arrow shaped. The dial features a date aperture between the 4 and 5 o'clock markers with a black calendar disc. The anti-reflective coating on the crystal allows the wearer to appreciate the dial without unnecessary glares or reflections. 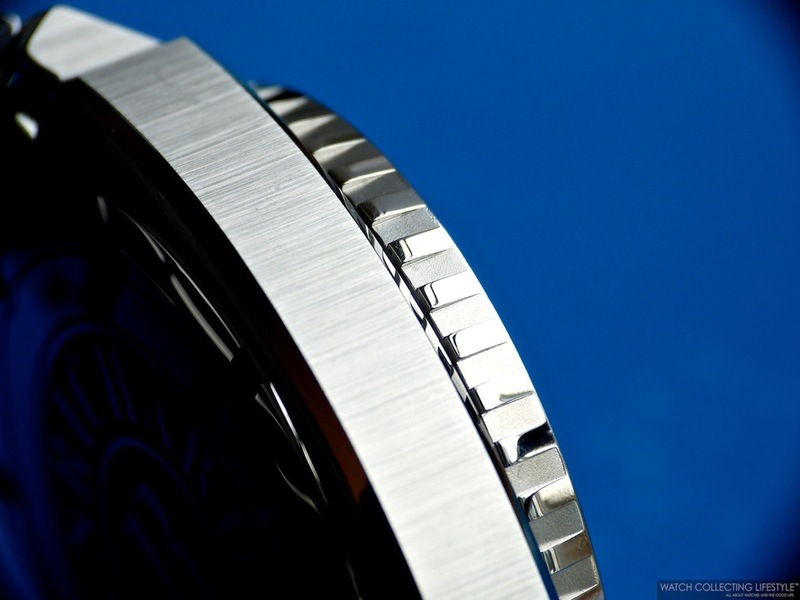 The bezel made of stainless steel is properly graduated with markers and minutes in dark blue that depending on the light can look slightly lighter in color. The unidirectional bezel rotates very smoothly and it is fitted with teeth that are easy to grip even when using gloves. The construction of the bezel is very solid and its design is very well balanced with a 12 o'clock marker with luminescent material. The screw-down crown was designed to perfectly match the teeth on the bezel and just like the solid case back, it is nicely engraved with JEANRICHARD's logo. This watch is waterproof rated to a depth of 300 meters or 30 Atmospheres. The beating heart inside this watch is the JEANRICHARD automatic calibre JR60 with 26 jewels and which provides a power reserve of 38 hours when fully wound, while beating at a frequency of 28,800 vph. This diver's watch is fitted with a sturdy and very well crafted elegant bracelet with double-folding clasp. Unfortunately the only two downsides of this watch come from the bracelet as it does not include a diver's extension —almost unthinkable; however but we've also seen that on the Tudor Heritage Black Bay— and it is not fitted with screws for easy removal of links —surprising considering that the watch is extremely well crafted. Regardless of the bracelet downsides, we really feel that this watch gives you great value for your money and unparalleled wrist presence. This watch wears considerably larger than 44mm —perhaps more like a 46mm watch— and the bracelet makes this watch wear very comfortably. This timepiece looks great with a casual attire or while wearing a suite. This is definitely one of the nicest diving watches in the market and so well crafted that you can almost forget you are wearing a sports watch. The Aquascope is also available on rubber strap and with grey, white or black dial. Sticker Price $3,500 USD. For more info on JEANRICHARD click here. Posted on November 18, 2013 by Editor & Publisher and filed under Other Brands, JEANRICHARD and tagged JEANRICHARD Aquascope JEANRICHARD Aquascope ref. 60400-11B401-11A Daniel Jeanrichard Posts 2013. 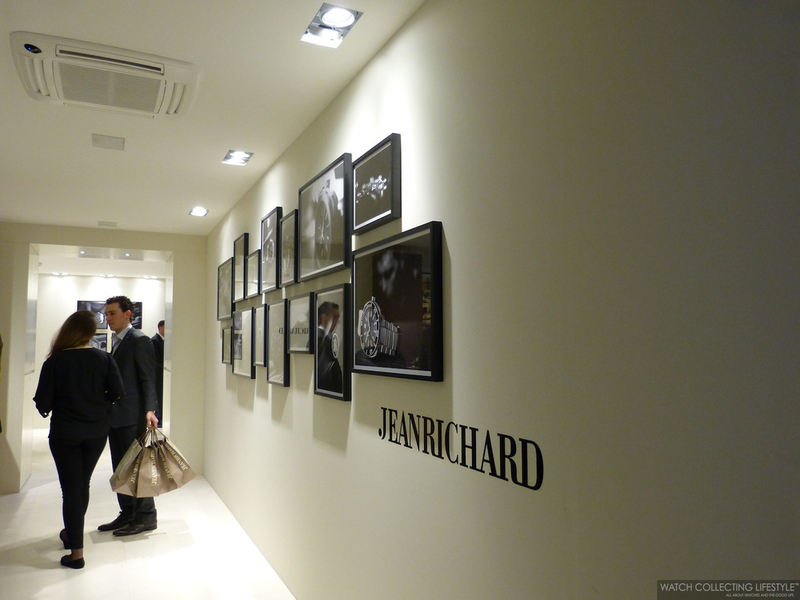 Baselworld: JEANRICHARD. Its First Time at Baselworld. JEANRICHARD—sister company to Girard-Perregaux— featured a small pavilion at Baselworld 2013, marking its first appearance. 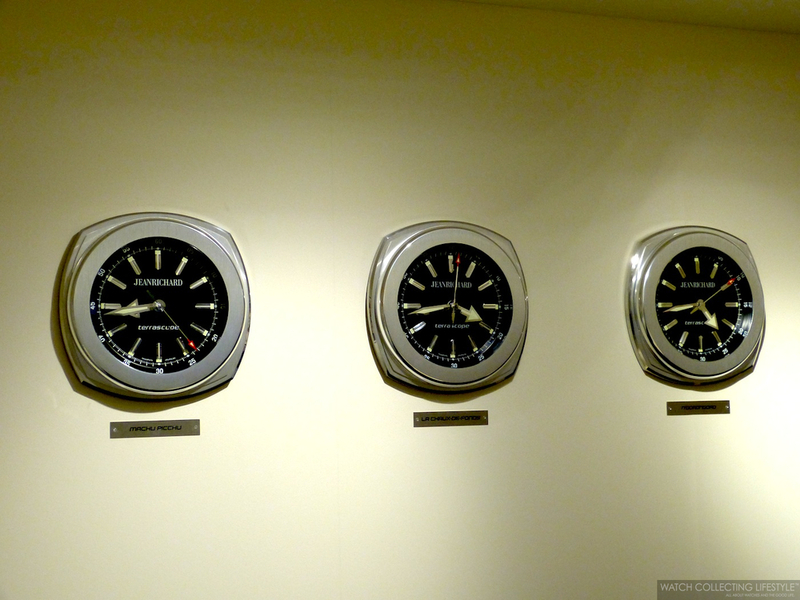 As you all know, both companies departed the SIHH last year and are now at Baselworld. For Girard-Perregaux it's a comeback, for JEANRICHARD a first time. JEANRICHARD takes its name from a legendary name in watchmaking, Daniel Jeanrichard. This genius pioneered the development of the watchmaking industry in the Neuchâtel mountains in the late 17th century. Daniel Jeanrichard was born in the hamlet of Les Bressels, midway between La Chaux-de-Fonds and Le Locle. In 1681, he created his first watch, then set up his watchmaking workshop. This brand includes four collections that pay tribute to the elements of our universe: Aquascope, Aeroscope, Terrascope and 1681. 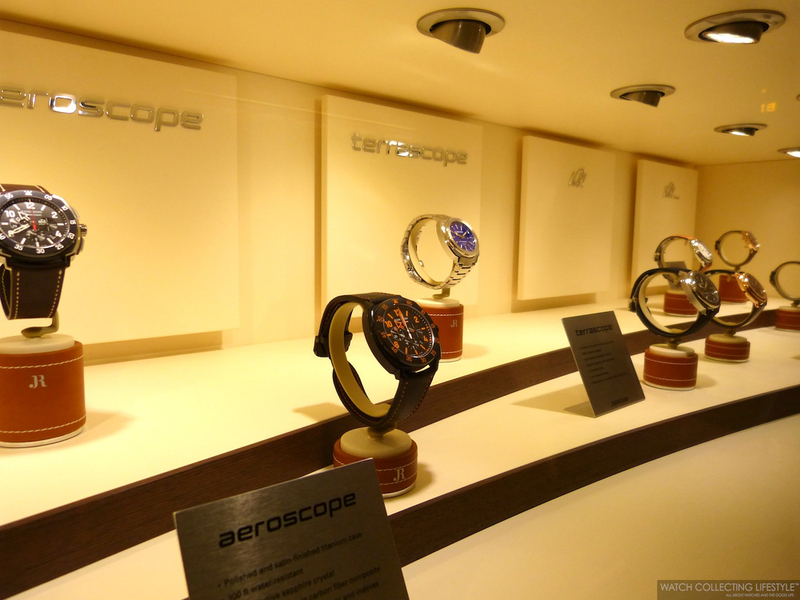 The novelties for this year include the new Aquascope and the Aeroscope chronograph. The Aquascope, an accurate, robust and resolutely masculine timepiece, has found the perfect ambassador in Franck Cammas. The French yachtsman was named “Sailor of the Year” in 2012. The Aeroscope chronograph with its cushion-shaped case in titanium is both light and robust at the same time. A large, round bezel with vertical satin finishing sits on the case, which is built of several parts, allowing for various satin or polished finishes and for a play with colours on the metal, natural grey or black with DLC coating. To accompany the take-off of this practical and exciting chronograph, JEANRICHARD chose an exceptional ambassador, a man known for his levelheadedness, his self-mastery and his passion for flying. An experienced pilot, captain Chesley “Sully” Sullenberger made history on January 15, 2009, when he ditched the Airbus A320 he was piloting in the Hudson River in New York City, saving the lives of all 155 people on board. 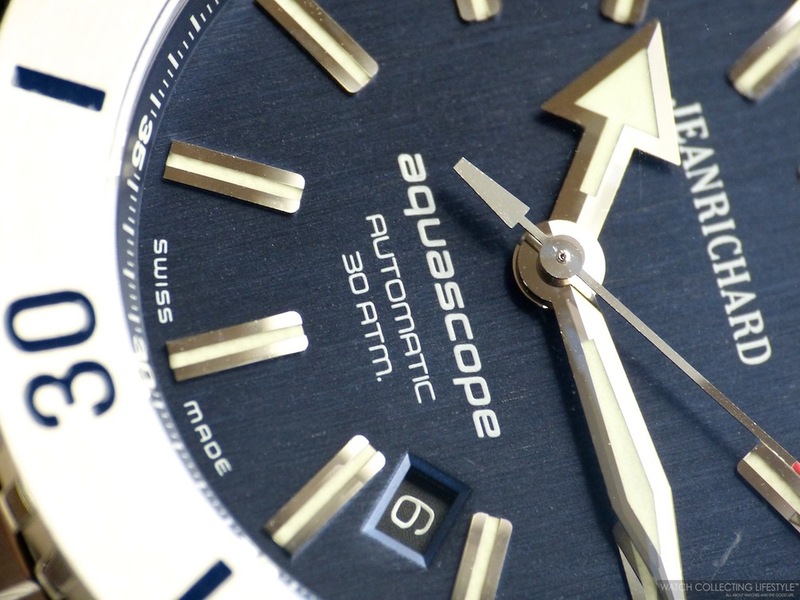 Posted on May 2, 2013 by Editor & Publisher and filed under Baselworld, JEANRICHARD and tagged JEANRICHARD Aquascope Terrascope Aeroscope Chesley Sullenberger Sully 1681 Franck Cammas Baselworld 2013.